Abstract: Objective To evaluate the applicability of Han strain bacterial artificial chromosome (Han-BAC) in small fragment mutation of the human cytomegalovirus (HCMV) genome.Methods A 31-bp long fragment of LUNA between UL80 and UL82 in the HCMV was chosen as the mutation target. Kanamycin resistance gene sequence flanking the homologous arms of the target neighbor sequence was used to replace the target sequence. Electronic transformation was used to rescue the mutated virus. Reverse transcription PCR and cDNA clone sequencing were used to identify the mRNA expression and the 3' terminal structures of LUNA, UL80, and UL82 transcripts.Results The 31 bp fragment was replaced precisely by the kanamycin resistance gene sequence. The efficiency of mutation was more than 3%. LUNA-mutated virus was rescued successfully. 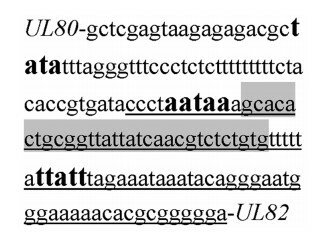 Transcriptions and 3' terminal structures of the UL80 and UL82 transcripts of the mutant virus were the same as those of its original virus.Conclusion The sequence at the transcription start site of LUNA was replaced successfully. The HCMV Han-BAC supports fragment mutation as small as 31 bp with a relatively high efficiency. J.萨姆布鲁克, D.W.拉塞尔, 黄培堂. 分子克隆实验指南[M]. 北京: 科学出版社, 2002, 101-102, 340-343. BORST EM, HAHN G, KOSZINOWSKI UH, et al. Cloning of the human cytomegalovirus (HCMV) genome as an infectious bacterial artificial chromosome in Escherichia coli:a new approach for construction of HCMV mutants[J]. J Virol, 1999, 73(10): 8320-8329.